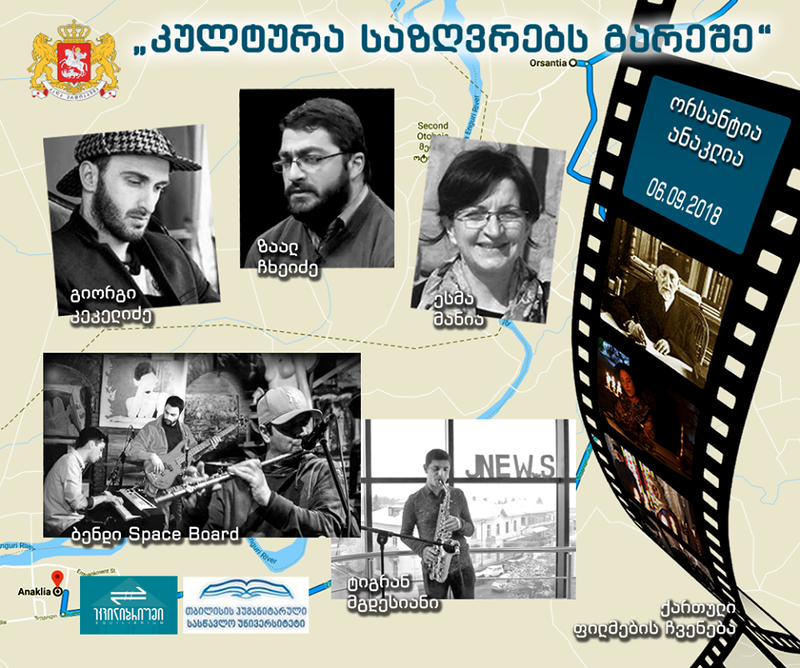 On September 6, writers and scientists – the director of the National Library of the Georgian Parliament – Giorgi Kekelidze, poet, writer and literary critic – Zaal Chkheidze, and a scientist at Korneli Kekelidze National Center of Manuscripts – Esma Mania will meet the local residents of village Orsantia and Daba Anaklia. Discussions about the importance of cultural dialogue, as well as the anniversary dates of the year - 100th anniversary of independence, Georgian writings 1918-1921, Alexander Kazbegi – 170 will be the major topics of interest. Also, within the scope of the meeting, it is planned to organize various exhibitions with the participation of local young artists and to showcase a short Georgian feature film. The conclusive part of the project includes a concert, which will be held in Anaklia with the participation of a Georgian composer and musician - Sandro Nikoladze and the band "Space Board". The concert will be attended by participants of the project "Culture without Borders" participants From Orsantia, as well as young people living in Zugdidi, as well as IDPs from Abkhazia. Best students from Ortansia public school will be awarded with special edition books, organized by the Ministry. Within the project framework, a great deal of significance is given to having books accessible to the public. At this stage, there are no libraries or gathering places in the aforementioned villages, where local population can benefit from it. With the involvement of Georgian publishes, on September 6, a book nest will be opened on the premises of Orsantia public school. There young people and not only, will have the opportunity to read a book, carry out any forms of educational activities, which will further promote their cognitive and educational level. 18:25 – 18:45 -Village Orsantia: Showcasing the short-length Georgian feature film. 20:00 – 21:30 - Daba Anaklia (Anaklia Fortress - Hotel "Palm Beach"): Musical concert performed by Sandro Nikoladze and the band- "Space Board. Attending the event is completely free of charge.